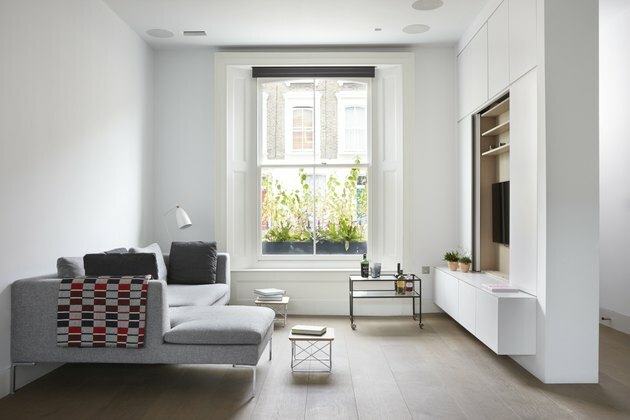 A couple with a six-year-old daughter fell in love with a Victorian terrace house in London's highly-coveted Primrose Hill neighborhood, but behind its charming 1860s façade was a mishmash of fragmented spaces created by past renovations. 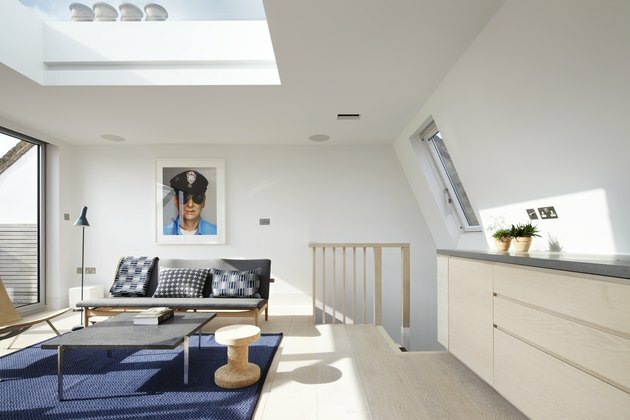 The two decided that it was time for a complete overhaul of the property, and made their main two priorities a seamless layout and an abundance of light. 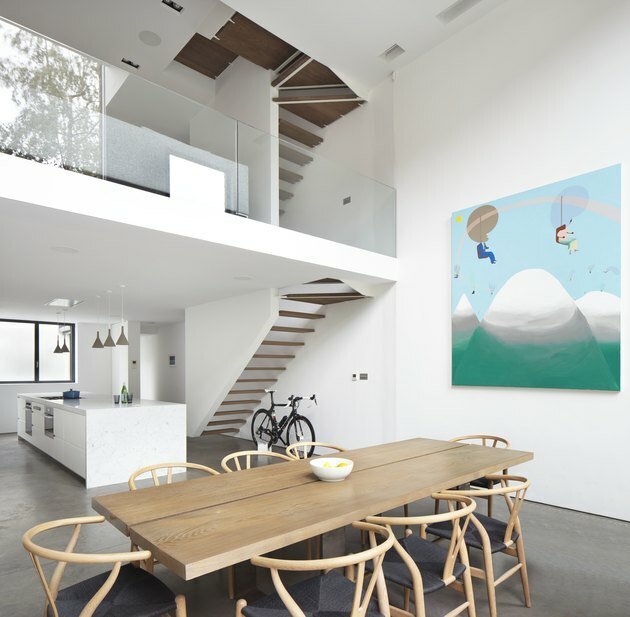 Architects Chris Romer-Lee and James Lowe, the founders and directors of Studio Octopi, were more than up to the challenge, but they were determined to preserve any remnants of the original architecture in the process. They removed the internal walls of the lower two floors and then installed a double-height kitchen, which is illuminated by the rear's new double-hung windows. When the panes are raised, the garden becomes a natural extension of the lower level, which is perfect for everything from morning coffees to cocktail parties. 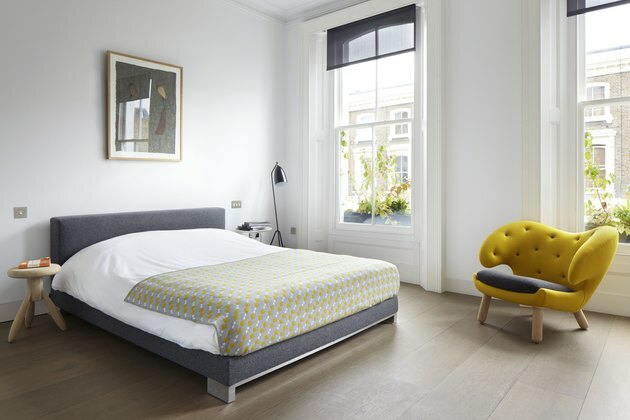 Upstairs, the team continued their mission with airy bedrooms and bathrooms defined by calm, inviting features. "There is now a flow between the floors, and visual links across these key spaces," said Romer-Lee. The finished address ticks all the right boxes for the couple: a bright, open, and spacious design that helps preserve a 19th-century home for generations to come. The Victorian façade was preserved and original details can be seen in the living area at the front of the home. "The house looks as all the other houses do on the street," Romer-Lee said. "There is no way of knowing what occurs within." The space is furnished with a B&B Italia sofa and Eames side tables. The expansive dining area opens on to the garden via large windows and a double-height glass door. Studio Octopi designed the table, which is paired with Hans Wegner Wishbone chairs. The minimalist kitchen is outfitted with Corian® counters, a Carrara marble island, and Foscarini pendant lights. 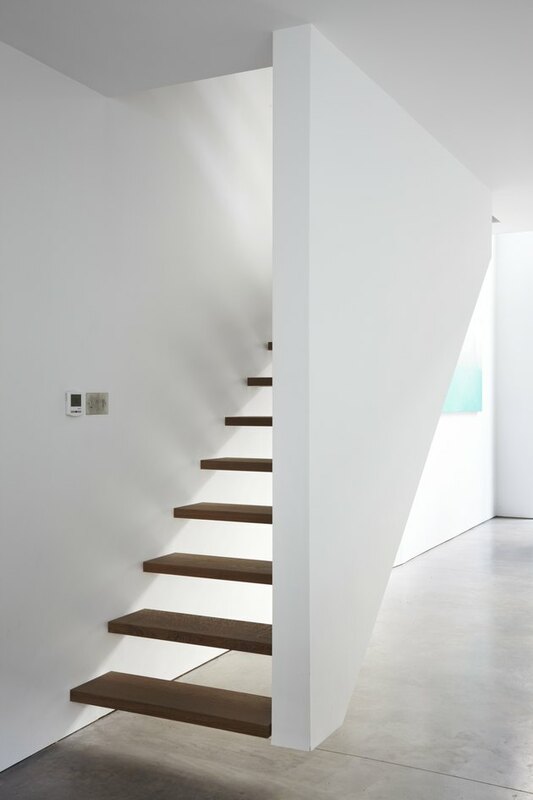 A striking new staircase connects the lower, ground, and first floors. A living room at the rear of the home overlooks the dining area. 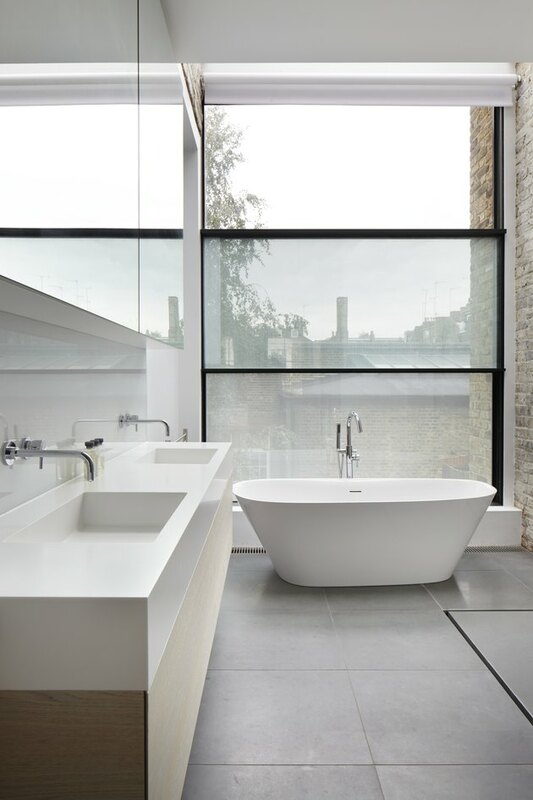 The architects used a glass balustrade to take full advantage of the light from the double-height windows. A B&B Italia sofa is paired with Hans Wegner chairs and a Fritz Hansen table. "The client wanted natural, warm materials with a muted gray background," Lowe said. The master bedroom features oak floors and a whimsical Finn Juhl Pelican armchair. A Pietra Serena stone floor contrasts with the Falper tub and Not Only White sinks. The snug room is equipped with a kitchenette and access to the roof terrace. A Finn Juhl sofa and a Vitra stool surrounds a Fritz Hansen table. 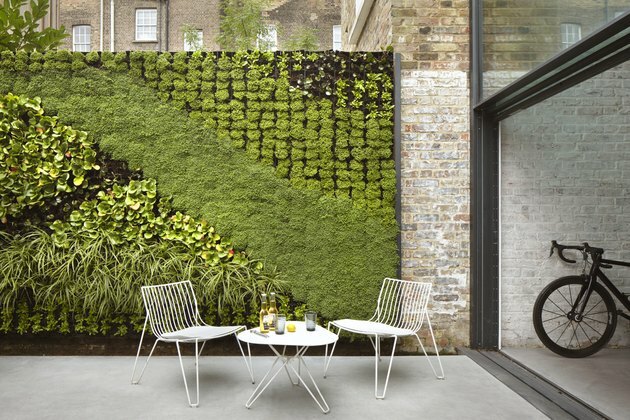 A living wall borders the garden, and the table and chairs are by Massproductions. 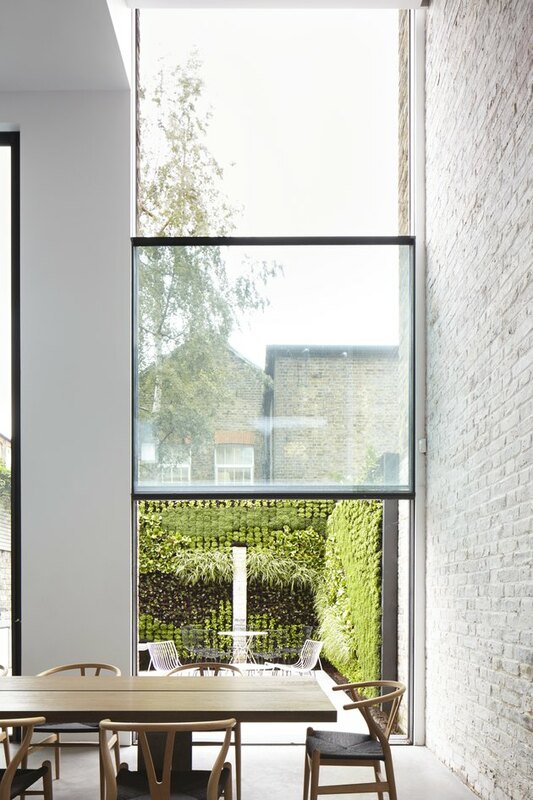 The team used London stock brick on the rear extension to match the existing exterior. Corian® is a registered trademark of E. I. du Pont de Nemours and Company.